For my business customers I want something to show of what can be done with office interiors. I took a old project of mine and placed a interior in one of the buildings. But with a complete exterior available I thought it would be nice to show it also in the render. I chose a late midday setting for the sun and tested a variety of presets. next Bright-high-HDR: the desktop looks fine now, but still a AA-problem. in this case QMC doesn't offer the solution. the AA problem is solved as aspected, but the desk reflection doesn't look nice. and some blotches too. the AA problem is gone, but still the reflection on the desk doesn't look nice. All of these scenes have issues. 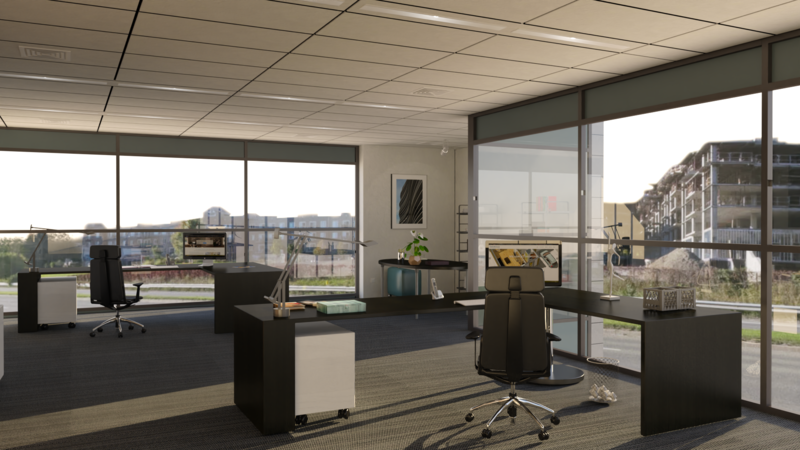 The graininess on the desk and panels over the windows is caused by the artificial lights. I'm not sure how they are configured, but they are the cause of that problem. You can see that the better images take a lot longer to render. What has happened here is that none of the presets are close to optimal for your scene. This doesn't happen too often, but it's what we have here. In effect what you need is a variant of the interior bright high HDR preset with the fine AA feature. I haven't built one of these because it will be quite a bit slower than any of the other presets. I changed some parameters on the Halla_Lina, so I reloaded the original from the Browser. I removed the exterior and replaced with a background and tested with default preset. The recessed lights have a Omni 1.00, the covering has a DTR 80-19-0 with a blurred transparency. Could the translucency be a problem? Generally the problem is high intensity LEMs with blurred reflection. If those linear lights are set up with omnis, they probably shouldn't be. LEMs are better for recessed lights. Try using a rectangular LEM panel behind the diffuser. However, you need the high or QMC preset for that lighting because the lighting on the shelves and the front of the photocopier is wrong. The Halla_Lina_Recessed has one point light in. There might be an High LEM that is causing problems. You could run Podium Tools Analyse and see. Generally an interior scene with High LEM will create a lot of noise. But it does not seem like you have that much noise except on blurred material. The preset that Big Stick is referrring was made for exterior scenes but you might give it a shot. It will slow the rendering down to a crawl though. What about increasing the size to width of 3000 and use QMC interior. I think the blur on the desk material and window metal panel (a lot of bump on that?) could be lowered as well. That preset won't help, because the lighting is too dark. It needs different tone mapping and a photon multiplier. It's not the solution though. Customers have entered scenes like this successfully in the past. There is something about the scene configuration that is problematic. There is no bump on those surfaces. High intensity LEMs do cause these issues, but it doesn't look like there are any in that scene. If you look at the interior_bright_high_HDR render it's pretty good, but the AA on the carpet is problematic. Therefore, an interior_bright_high_fineAA_HDR preset ought to work. It would be the one of the highest possible quality presets we could build but render time will be sloooow! The problem with adding presets of this type, is that some people simply choose the highest quality preset by default thinking it will magically make their render a lot better. They will end up with a very slow render time and think that Podium isn't very good because it's slow, when actually the reverse is true. The key is to configure scenes in such a way that they will render effectively. Podium is stunningly fast in most cases. 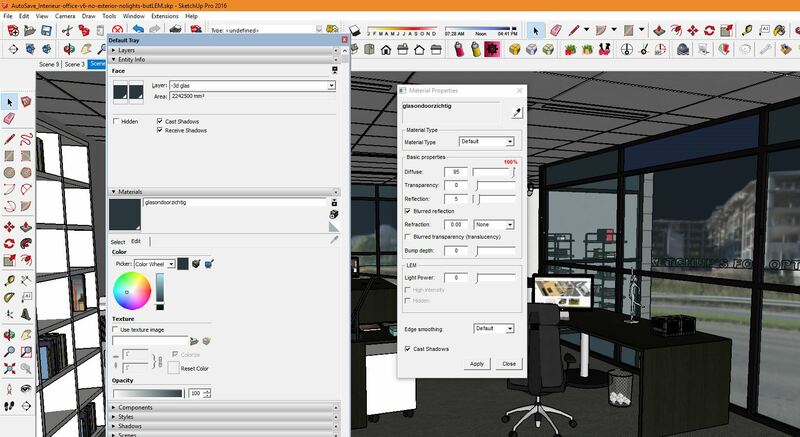 When I export models from architecture into SketchUp to render with Podium, I can have my render configured and finished before a Cinema4D render of similar quality has finished in Archicad. I also get the benefit of PIE and things like line overlay. thanks for thinking along. I did a test with a LEM instead of Omni lights in the armatures. Removed the omni and placed a LEM behind the diffuser. In the analysis I can't find nothing wrong. to eliminate that the furniture is causing problems. (the shelf case is part of the Office_Assemblies_18) I removed all and purged the skp-file. I still can try a QMC render. I suspect that this model has some problems. Usually I build the models from the ground up in SU. In this case I imported a 3D model from a AutoCAD file. But even after exploding all unnecessary groups and making sure that the face is not reversed and material applied on the face, I still having these problems. I also checked if there where faces occupying the same space..no result. Do you guys have any experience with importing 3D AutoCAD in SU? here's the QMC render. not really an improvement.. There are a number of things here which are multiplying the issues. 1. The carpet texture is 'noisy' which means that you are getting moiré patterns unless you use the fine AA presets. Change the carpet and results will be better. 2. There are lots of artificial lights, and they sometimes have a noisy reflection in surfaces with burred reflection. 3. The number of artificial lights means that you need a higher quality render preset. This means the interior high (or interior bright high) or the QMC preset. For current purposes, whether you use an HDR preset or not makes no difference. Unfortunately, the QMC preset itself is noisy, which means you ought to use a QMC fineAA preset to reduce the noise, but this will increase render time! 4. You have not used the Halla Lina recessed lights correctly, and I suspect they are not properly configured. They are designed for continuous slot lighting, and there are recessed versions to go in plasterboard, and suspended versions. Because they are designed to be joined in continuous lines with no gaps, the output should be slightly lower than for a standalone fitting designed to be spaced apart. I suspect that the output is too high. If you look at these images, nowhere can you see the angles pattern on the wall caused by the light distribution. The power is too high. You have also fitted them with gaps between them within ceiling tiles, which is not how they should (or can) work. That's not causing the problem, but coupled with the fact that the power is set too high, placing them too close together is definitely an issue. With a preset-based approach, we can't anticipate every single render configuration and provide presets which are optimised for all scenes. Most of the time they work pretty well, but here we have a whole load of things that are compounding the issues! Changing the lights and/or the carpet should help. HDR presets should always allow you more flexibility in post-processing. Fine AA presets should help with noisy images. Can you upload the model privately. I would like to try this out on ProWalker GPU. Also, I think QMC would work but at double or triple the image size and then scaling it down. If you can not share, are you on Windows with an Nvidia GPU? If so, give ProWalker PR mode a shot. This is a fast path tracing mode which is like QMC. Leave Denoise on. I realize that there's not a preset for every possible scene and that is not what I expect of SU Podium to deliver. Personally I'm still struggling with scenes with complete artificial lighting. Mostly my indoor scenes turn out to be too dark, so I add more lights or amp up the Omnies. But there seems to be a fine balance in tuning/tweaking/adding lights and after all the PP. Dave, I will send you this model, I would like to see what Walker can do with it. The blur on the panels is better now. There's still room for improvement: I can turn the view perpendicular on the lines of the ceiling to reduce the AA-problem and the window frames need some work. outside I placed a skydome and tweaked the color and transparency of the windows to get a more sundown feeling. Just a little PP. I will make another scene with fewer Omnies and see if I can make this better. Ah - you adjusted the light power on the Browser fittings! That’s never a good idea. It’s really tricky getting the power right. Too much and the engine has problems and the scene is over-lit. 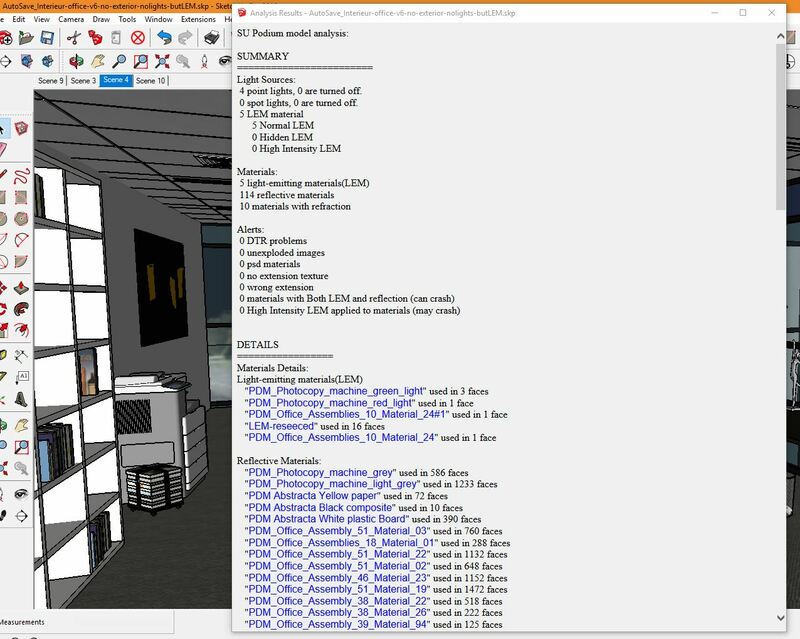 Render time is also longer because the additional light level takes longer to calculate. The ceiling LEM has blown out the indirect lighting at the juntion between the walls and ceiling, which doesn’t look natural. Use the HDR presets and brighten in PIE. Its easy enough to brighten an image bit much harder to darken it. What most people forget is when we render, we are trying to duplicate what we see. But what we see is not real. It’s a constantly adjusting realtime brain equivalent of a Photoshop adjustment to equalise the lighting. This is why we need HDR images. If we use PIE, we are more accurately simulating what we see. It sounds counter-intuitive, but it’s true. Here is a ProWalker GPU result. This was done in PR mode (full path tracing) with Denoise at 1000 samples and 1920 X 1080. I took off the LEM on the monitor screens. They were coming out just white in ProWalker. Oke, lesson learned. don't mess with the Omni settings... Thanks for your patience. Thanks Dave, looks very lovely! The glossiness of the desk looks very nice. Is this level possible in SU Podium?